Exposure to ultraviolet (UV) radiation from the sun and other sources, such as solariums, is the major cause of skin cancer. Australia has some of the highest levels of UV radiation in the world: in fact UV radiation is strong enough to cause sunburn in as little as 10 minutes on a fine January day. Your skin retains much of the UV damage you receive – the sunburns, tans, solarium visits or just simple day-to-day time spent outdoors when you have not used sun protection. It all adds up and increases your long-term risk of skin cancer. It’s estimated that if we reduce our lifetime exposure to UV radiation by just 20%, Australia would have about one third fewer cases of skin cancer. UV Index – An internationally standardised open ended numerical scale developed by the World Health Organization that measures the amount of UV radiation reaching the earth’s surface. It begins at zero and has no upper limit. The UV Index is often represented as a number line with accompanying action statements and descriptive words which convey UV intensity. Max UV Index – A single number representing the peak UV strength for the day, which is normally reached at solar noon on a clear sky day. Sun Protection Times – A daily time period showing when UV levels are predicted to be 3 or above, and sun protection is needed. The sun protection times vary according to your location and will change throughout the year. To find the sun protection times for your area, see our homepage. Solar Noon – The point at which the sun is directly overhead. This does not always correspond with 12 pm local time. Note that UV rays are typically strongest at solar noon while peak temperature can be later in the afternoon. Skin Cancer – The sun’s UV radiation is the major cause of skin cancer and also the best source of vitamin D. Too much exposure to UV radiation can cause sunburn, skin damage and skin cancer. Too little UV exposure can lead to vitamin D deficiency. That’s why it is good to watch the UV index. It’s safer to get sun under UV3. Skin Type – The Fitzpatrick Skin Type scale is a way of classifying a person’s skin type. It is based on skin response to sun exposure in terms of the degree of burning and tanning. The scale shows six main skin types. It is important to consider your skin type in regards to your sun exposure. 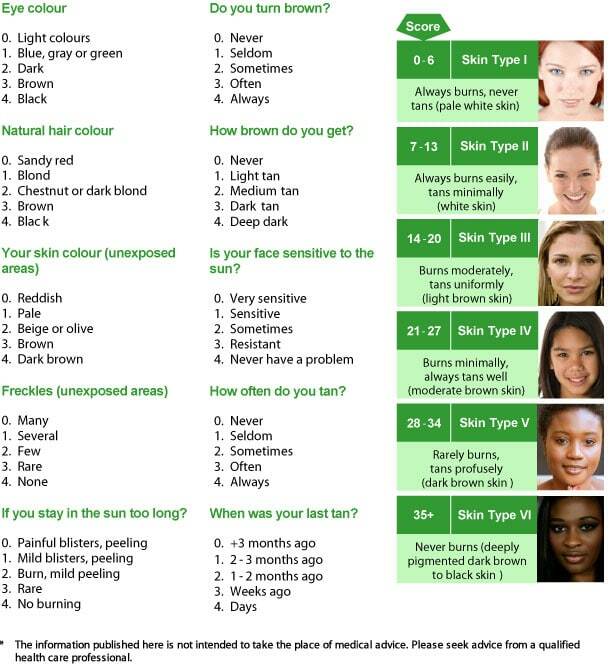 Take the quiz above to find out your skin type. Vitamin D – UV radiation from the sun is one of the best natural sources for vitamin D so a balance is important. Vitamin D helps to develop and maintain healthy bones and muscles. Ozone – Ozone is a naturally occurring form of oxygen in which the molecule contains three atoms instead of two as in the common form. Ozone molecules form a gaseous layer in the upper atmosphere, and protect life on earth by absorbing much ultra-violet (UV) radiation from the sun. UV radiation is linked to skin cancer, genetic damage and immune system suppression in living organisms, and reduced productivity in agricultural crops and the food chain. Scientific evidence has proven that the natural balance of stratospheric ozone has been upset by the production and release into the atmosphere of ozone depleting substances that were commonly found in refrigerators, airconditioners, fire extinguishers, aerosols, agricultural fumigants, in foam and as solvents for cleaning electronic equipment. Remember to protect yourself from skin cancer in five ways.